Account owners and users with the super user privilege can perform all aspects of user management in OneLogin, but your organization might want to delegate user management to users who don't need all of the access associated with the super user privilege. OneLogin provides the following privileges that let you delegate user management. Users with the manage users privilege cannot assign privileges to other users, but they can revoke privileges. 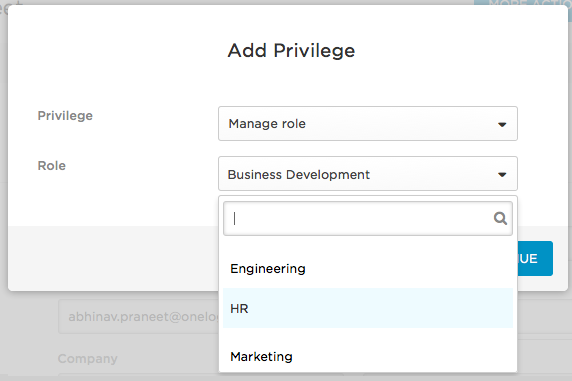 Adding privileges is a right limited to account owners and super users. 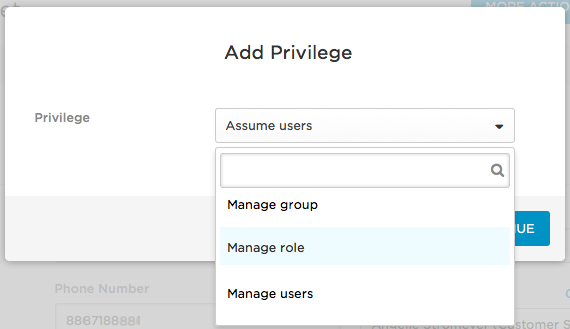 This is an add-on to the manage users privilege that lets you "take control" of other users. This means that you can look into the personal account settings of other users in order to diagnose improper configurations and troubleshoot issues. You cannot view passwords for a user's apps that use form-based authentication, nor can you sign in to their apps or view their secure notes. Help Desk users cannot be granted the assume users privilege. Users with this privilege, also known as group admins, can perform all user management tasks for the users included in a OneLogin group. They cannot, however, add new users to the group. To assign any of these privileges to a user, you must have the super user privilege. Log in to OneLogin as an account owner or super user. On the Add Privilege dialog, select the privilege from the Privilege dropdown and click Continue. For the manage group or manage role privileges, you must also select the group or role for which you want to grant the privilege, and click Continue.